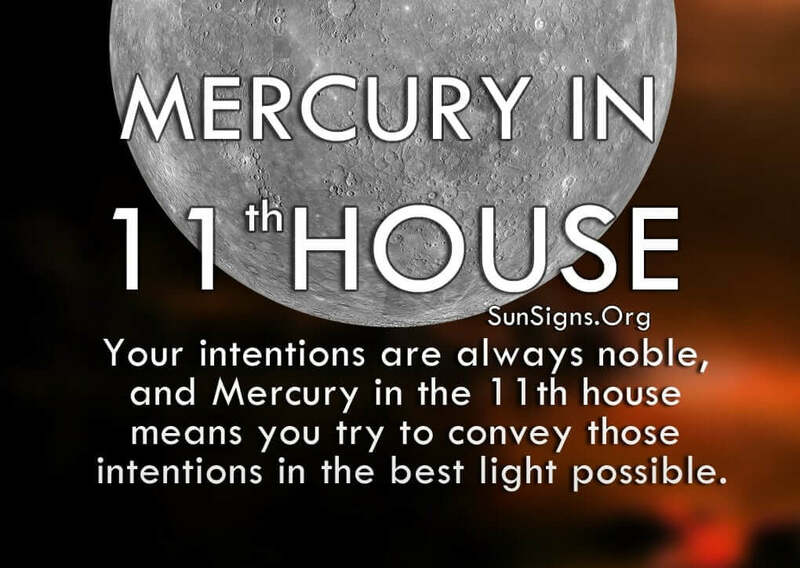 Your intentions are always noble, and Mercury in the 11th house means you try to convey those intentions in the best light possible. Sometimes you succeed while other times you confuse people. But you know what you want, and you know how to get it done. It just takes time. Mercury is symbolic of communication, knowledge, wisdom and ability to relate to things. The word that best describes the 11th house is unique. You have your own way of doing things that may seem strange to others, but gets you results. But the way you work is bouncing your ideas off other people to see if they can lead to a viable solution. You’re able to communicate effectively enough to engage people in a debate, and then let them stretch out your theories. This, in turn, helps you to manipulate your ideas in such a way that they eventually work. While your peers may not understand where you’re headed, you begin to form a clear path in your mind. And once you reach the end, you’re able to show them that this is where you were going all along. That’s when they finally understand your vision. Because of this, the Mercury in eleventh house people surround themselves with people from all walks of life, as you are constantly looking for new ways to look at things. You want people in your life who can take your idea and offer you a fresh perspective. This also makes you very open-minded and people are drawn to your natural acceptance of anyone different. You often have a large social circle because of this and believe in social justice. With this belief you want to make the world a better place, and your theories are often about how to do that. You are a humanitarian of sorts, and you’re always looking for ways to improve upon the way people live. If you have Mercury in the 11th house in your horoscope, you might have trouble saying the right things at the right time! Sometimes it just takes one person to say the right thing, and everyone else is able to understand immediately. Test your conversational skills one-on-one to really hone in on what works and what doesn’t. This may help you to organize your thoughts in a more efficient manner as well. Sometimes you can be a bit scatterbrained because you have so much going on in your mind. Because of this you often have trouble keeping your life together and taking care of daily responsibilities. While the real world is boring, it’s something you have to deal with on a regular basis. Work on balancing theory with reality. The Mercury in 11th house astrology shows that you hate when things are imbalanced, and your goal is to right the wrongs. This leads you to always be thinking about the future and ways to make it a better place. Because of this, you are able to think outside the box and want others to join you. In this way, you are able to communicate your ideas effectively enough to get other people on-board. Being the social butterfly that you are, you often learn how to talk to other people in such a way that they understand where you’re coming from. It just takes time for you to work through your ideas and reach a point where you can discuss them effectively. Because you like to work in a group, you can rely on the other members who know you well to also relay your thoughts.